Pull-out spice racks flank the hood. Oil-rubbed bronze knobs and pulls. Elegant glass doors reveal items for display. serves as a buffet, with drawers for silver. Underneath are pullout drawers behind raised-panel doors. a wrinkle-free solution to storing tablecloths. straight out of the dryer. storage forserving pieces or other items. This beautiful hood is cherry-stained maple. while smaller corbels support the mantle above. wood or high-quality MDF material. in kitchens where items are displayed. can make a dramatic statement. designed, crafted and installed by Prater-Built. include mail slots and divided book slots. Prater-Built has handcrafted fine cabinetry in the Cabot area since July 1995 when, during a booming housing market, Chuck Prater established Prater-Built Cabinets to serve the central Arkansas area. For two decades it has met with enormous success. Prater-Built has established itself as a cabinet builder with not only the finest in quality cabinetry, but also a reputation as "tops" in customer satisfaction. Prater-Built strives to meet any and all desires of the builder or home owner. Chuck, who is 100% involved in every aspect of the business from design to installation, is highly respected by home builders in the Cabot area. "He's simply the best," comments Claude Irvin (retired) of C.E. Irvin Construction, Inc. Prater-Built's promise to its clients is quality initiative for a quality result. Fine cabinetry is Prater-built. Prater-Built offers a complete line of whole-house cabinetry, including kitchen, bath, laundry room, garage, and any residential living space. We also offer specialties such as custom entertainment centers, display shelves, built-in closet dressers and shelves, and custom-built desks. In addition, we build handicap-accessible cabinetry, as well as commercial cabinetry for businesses and churches. To suit the client's taste, Prater-Built custom builds quality cabinetry with a wide selection of contemporary and traditional door styles to complement any room of the home or business. The Prater-Built cabinet may be constructed from a variety of quality materials including cherry, maple, ash, pine, hickory and oak woods, or a premium paint-grade manufactured material, using only the very best quality hinges and drawer slides. Many aspects of our cabinets are built using time-proven techniques and are built stronger for lasting durability, capable of withstanding the weight demands of newer counter top designs. 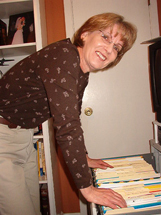 But most importantly, Prater-Built Cabinets are custom built with the customer in mind. We are not an "in-stock, pre-manufactured cabinet factory." We take the individual customer's ideas, needs and desires, along with the builder's specifications and combine them with our quality materials and workmanship to create an heirloom-quality product that is built to the homeowner's complete satisfaction. 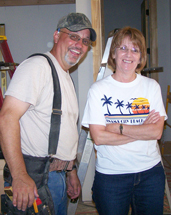 Prater-Built Cabinets, Inc. began in Chuck and Darlene's garage with one employee, Darlene's brother-in-law Frank. 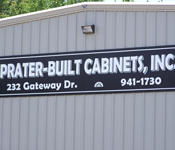 Within months the demand for Prater-Built Cabinets increased to the extent of requiring a much larger facility with the addition of several employees. The quickly-growing company rented a building on Arena Drive, and shop foreman Tim supervised an expanded Prater-Built team.